Lt. Gov. Karyn Polito was on the campaign trail recently in Marlborough, speaking at the New England Sports Center as Mayor Arthur Vigeant and NESC General Manager Wes Tuttle look on. Marlborough – Lt. 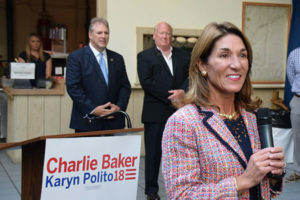 Governor Karyn Polito asked for four more years in the Statehouse at a gathering at the New England Sports Center in Marlborough recently. Polito and Gov. Charlie Baker are both seeking re-election in this November’s state election. The campaign event was sponsored by Mayor Arthur Vigeant, Joe Trolla, Wes Tuttle, Meredith Harris, Dave Walton, Rodney Frias and Jim Kane. 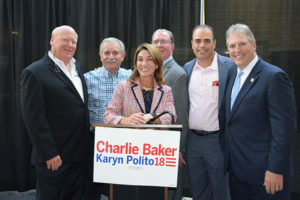 Many of Marlborough’s business owners and managers, Chamber of Commerce members, and city officials were on hand to greet Polito and assure her of their support. “Help us continue to make Massachusetts the best place to live, work and play,” she added. (l to r) Wes Tuttle, Joe Trolla, Dave Walton, Rodney Frias and Mayor Arthur Vigeant were among the sponsors of an evening with Lt. Gov. Karyn Polito as she made a campaign stop at the New England Sports Center.